In 2018, solar power systems were installed at three of Stanbic Bank Ghana’s branches, lowering their carbon emissions and making the bank more environmentally friendly. The three systems, which have a total capacity of 40 kWp, will cover 30% of the branches power consumption and save 27 tonnes of CO2 emissions per year. The energy transition is still at an early stage in Ghana, especially in the commercial and industrial sector: by choosing to use solar electricity, Stanbic Bank is leading the way for other businesses to do the same. The project was implemented by ecoligo GmbH in cooperation with procurement and installation partners, and is part of the German Energy Agency (dena)’s Renewable Energy Solutions Programme. 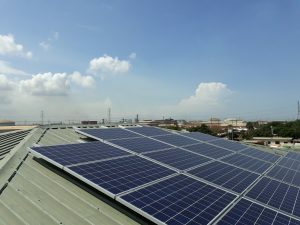 Solar power systems were installed on the roofs of Stanbic Bank’s Tema, Kasoa and Dansoman branches in July 2018. The systems at Tema and Kasoa have a capacity of 10 kWp, and the system at Dansoman has a capacity of 20 kWp. These systems provide 30% of the energy needed for each branch. At night or on cloudy days, electricity is procured from the national grid. 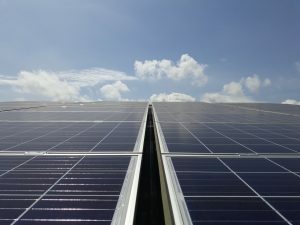 How can Ghanaian businesses get solar? In Ghana, businesses are very well-suited to being powered by solar energy. By decreasing their CO2 emissions, they can become more sustainable: an increasingly important factor for both B2B and B2C customers. As finance can be hard to find for such projects, ecoligo provides a fully financed leasing solution. This means that companies don’t need to make a large upfront payment, and they also don’t need to manage the solar system. This is taken care of by ecoligo and its partners, while the customer just receives worry free, clean energy. How does the leasing agreement work? 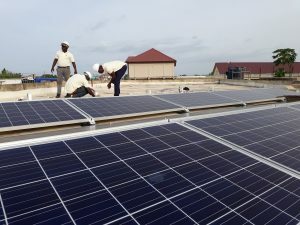 ecoligo finances the solar system and works with local partners to install the system on the property of the business: for example, on the rooftops of Stanbic Bank’s Dansoman, Kasoa and Tema branches. Stanbic Bank leases the solar system from ecoligo, making regular, fixed payments over a period of time. This payment includes the maintenance of the system. After this period is over, Stanbic Bank owns the system and only pays for the system’s maintenance after this point. This agreement is not only available for banks, but for other types of business and industry too. Find out more about powering your business with solar energy here. This project is part of the worldwide dena Renewable Energy Solutions Programme coordinated by the Deutsche Energie-Agentur (dena) – the German Energy Agency – and supported by the German Federal Ministry for Economic Affairs and Energy (BMWi) within the German Energy Solutions Initiative. Find out more on our partners page.